WHAT IS IT? The NEW Model CT is comprised of a Control Unit and Tilt Probe senses the presence or absence of material. The new intrinsically safe, cULus Listed Control Unit is enclosed in rugged cast aluminum housing with LED Indicator lights and surface mount printed circuit board. Weatherproof, Dust-Ignition Proof and Explosion Proof models are available. The rugged steel sensing Probes are cULus listed as intrinsically safe when used with the new cULus Listed Model CT Control Units CT-105, CT-106 or CT-107. WHY IS IT NECESSARY? The Model CT is commonly used when other controls won't work due to bin vibration, or actual bin walls aren't available for mounting other controls. Typical applications include level detection in hoppers, silos, stackers, crushers and conveyor transfer points. Typical (controller) cardboard shipping carton measures 11" x 9" x 8" each. 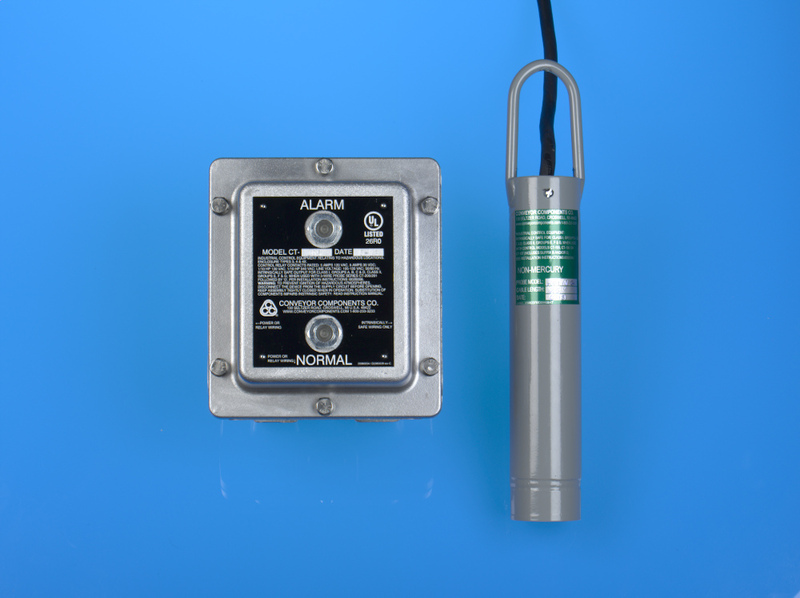 Tilt Probes are Intrinsically Safe for Class I, Groups A, B, C & D; Class II, Groups E, F & G Hazardous Locations only when used with CT-105, CT-106 or CT-107 series controllers. Typical (probe) cardboard shipping carton measures 17" x 11" x 8" each. * The "H" suffix designates high temperature use. However, please be advised the high temperature probes are not cULus Listed. * For welded-on paddle, add "P" suffix to model number, add $8.00 to price. * For welded-on S.S. paddle, add "SP" suffix to model number, add $14.00 to price. CT-300G 16-3 SO (3 conductor) probe cable 0.09 lbs./ft. $0.79/ft. Durable cast aluminum NEMA Type housing with externally visible red and green LED Indicator lights. General purpose controllers are rated NEMA Type 4, 4X - weatherproof and corrosion resistant. Dust-Igntion proof controllers are rated NEMA Type 4, 4X; NEMA Type 9 Class II, Groups E, F & G - Hazardous Locations. Explosionproof controllers are rated NEMA Type 7 Class I, Groups C and D; NEMA Type 9 Class II, Groups E, F & G - Hazardous Locations. Surface Mount electrical components used on printed circuit board. The controllers have a dry, unpowered relay rated for 5A @ 120 VAC and 240 VAC. The ambient temperature must not exceed 104°F (40°C). 9" heavy duty and 6" compact mild/carbon steel probes available. 304 stainless steel is optional. Allows up to 5,000 feet of cable length between Control Unit and Probe. Special float balls and paddles are available for use in fine grained bulk material to assist in tilting the probe. Tilt Probes are intrinsically safe and cULus Listed only when used in conjunction with the CT Control Units (CT-105, CT-106 and CT-107).